Ever heard of a tagline” Utterly Butterly Delicious“. Sure you have ! Over the years, Amul, has evolved to become one of the most beloved brand of our country. Amul girl, the brand’s mascot in the polka-dotted dress, has become a nostalgia-evoking symbol. A much-loved icon of modern India, the deliciously witty Amul girl has for more than five decades managed to stay relevant with witty humor, timely punchlines, and old-school charm. She has been the main protagonist in every communication that Amul has rolled out in more than 50 years now, and captured the imagination of every Indian, irrespective of region, language, gender or age. Before taking a deep dive in the Why, What and How of the marketing strategy of Amul, let’s take a look at few other important factors that contribute in formulation of a marketing strategy. To offer quality products at an affordable price. “Quality with affordability” has been the mantra and the unique selling proposition of the brand. From the start, Amul has been a mass-market player and has targeted B1, B2 and C customer segments for its products. When Amul was formed in the year 1946, consumers had limited purchasing power and modest consumption levels of milk and other dairy products. Amul adopted low-cost pricing strategy to make its products affordable and appealing to customers. This strategy helped Amul position itself as an affordable and quality milk and milk products manufacturer. Amul has a diversified product portfolio and has been able to cater to the needs of all the segments from kids to old alike. From Amul lite to Amul ice-cream to Amul beverages, the product portfolio of Amul has something for every age group of customer. Brand’s Tagline – The Taste of India wasn’t just a corporate positioning or an advertising jargon, it was a commitment that the brand made to its customers. The brand had a big task at hand – to make quality food and products accessible for every Indian, and the company went all guns blazing to achieve this mission. The first step towards achieving the goal and to really make the brand the taste of India, Amul formed a distribution strategy that made its products available at even the remotest of the areas. Apart from its exclusive “Amul stores” which sell its products, Amul boasts a strong network of supply-chain for distributing its products. 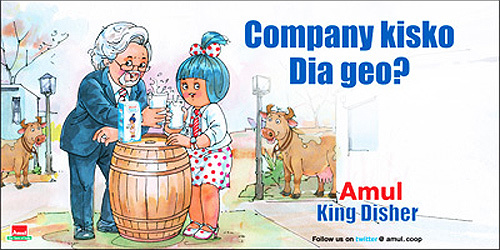 Amul’s witty take on Vijay Mallya’s stake sale of United Spirit’s to Diageo. 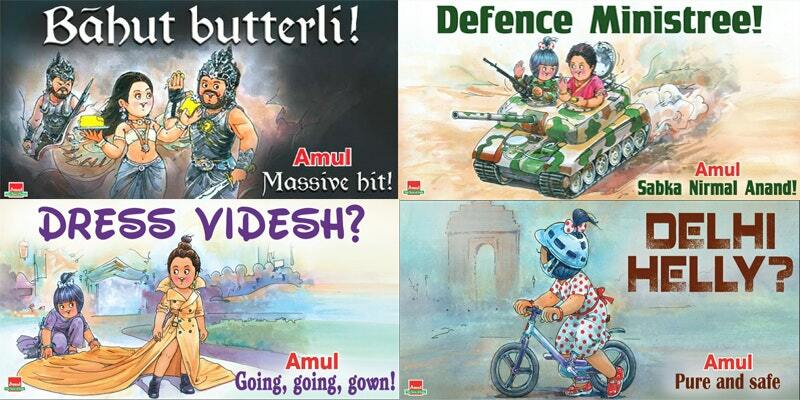 The most important thing about Amul ads is at what time of the curve they catch the issue. Over the years, Amul has emerged as an opinion leader having its own witty take on the most current issues and significant events. AMUL CREDO IS – Huge ad campaigns are not required to create a mark in the customers’ mind, what is required is an interesting way to interact with your customers. Offline channels (ATL, BTL): The main aim of the offline channels is to increase brand recall and brand awareness. The offline channels of promotion included sponsoring television shows, Newspaper and magazine ads, Billboards etc. Digital channels: Changing times needed a change in the advertising strategy. In order to target millennials, Amul started using digital channels like Facebook, Instagram, and Twitter for promoting their products. Digital channels not only helped the company get first-hand reactions of the customers for their products but also gave them the opportunity to interact with them on a one-to-one basis. This concludes the marketing strategy of Amul, if you guys have some points to add on, do leave your comment in the comment box. ← BCG Matrix of Starbucks | Bean there, Brewed that!